Skipper Andy Teague admits he and the Chorley players are itching to get back on the pitch. The Magpies have had a frustrating Christmas, playing just one game out of a scheduled four. They last took to the pitch on Boxing Day when they beat Bradford Park Avenue 2-1. Since then, games a Stalybridge Celtic, Bradford Park Avenue and a home tie with Oxford City have all fallen foul to the weather. This Saturday, Chorley are set to take on FC United of Manchester in the second round of the FA Trophy. And the weather forecast suggests the game should thankfully go ahead. Despite their lack of action recently, Teague insists there won’t be any pitch issues come 3pm this Saturday. He said: “It’s been a frustrating time for all the lads. “It has been tough. We have had to watch other teams get games in while ours have been cancelled. “But we’ve been keeping ourselves ticking over in training and we are itching to get going this Saturday. “Hopefully the weather doesn’t have an impact on the game. A small rivalry has developed between Chorley and FC United, and it grew last season as the two clubs battled it out for Evo-Stik Premier Division honours. The sides met in the FA Cup as well as twice in the league. At one stage, Chorley had a lead of more than 15 points over the fan-owned club. But Karl Marginson’s side went on a tremendous run, closing the gap and temporarily sat top of the league. slip-ups, Chorley took advantage and a memorable victory over Buxton on the final game of the season saw the Magpies crowned league champions. He said: “Both sides are completely different and we have moved on. “We enjoyed a good battle with FC last year and fortunately we managed to win the league. “On Saturday, we’ll go into the game full of confidence, we know what to expect from them and they only play one way. The four will don the black and white stripes of Chorley on Saturday with it being the first time Mulholland will face his former club. And Teague expects the trio to relish the chance of battling against their former colleagues. He added: “The lads are experienced and they will know what to expect. “In particular, Sam and Jake played against FC United last year, including the big game at Gigg Lane. A bumper crowd is expected at Victory Park with an allocation of 1,100 given to FC. 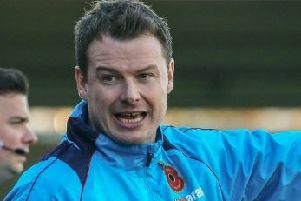 AndTeague is hopeful the Chorley fans can be seen in some force too. He said: “This is where we need our fans to turn out and sing loud and proud. On-loan centre half Chris Doyle has returned to parent club Morecambe after his loan period expired, and no replacement is expected with Tom Smyth recovering from injury.